How about you? What are you stitching? What's on the nightstand? Got a crochet CAL you can recommend? Leave a message if you do, with a link, thanks! If you'd like to link up with us...please do..and please link back...thanks! I'm sure there are other groups on Ravelry that are running CALs. There's also Kim Gussman (CrochetKim) on Yahoo Groups. Ooh, does "fresh off the needles" friday take up the place of Tami's Amis FO Friday?? I'd been posting on Tami's semi-regularly when I noticed she started lagging in the frequency of the link up. I'll definitely check this link up out! I'll be sure to come back and post here next Wednesday--nothing posted on my blog today to link up unfortunately! Sounds like you are going to have a happily busy 2015. On my needles --- Shark Infested Waters socks. 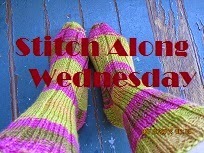 Thanks for getting a new Wednesday linky party! I missed it!